Stellar Field for Asian Le Mans Series Opener! 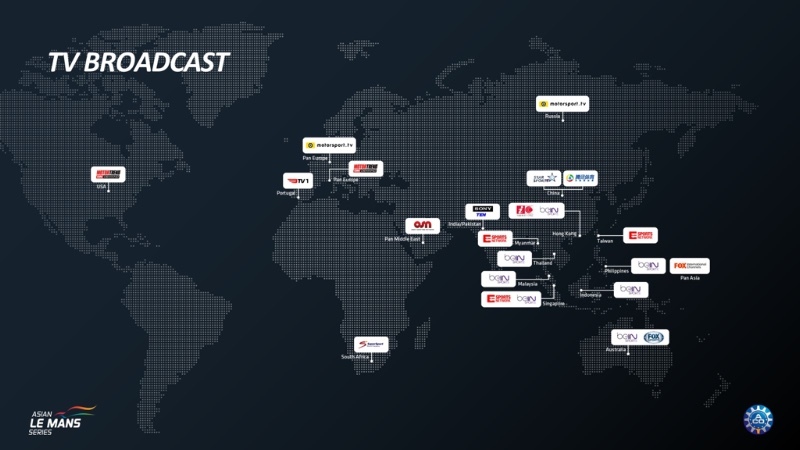 New entries, returning champions and continued long-time partners are set to deliver a thrilling season, with coverage of on track action to be covered by a world class broadcast package available for free around the world. The entry list for the Agile 4 Hours of Shanghai features 27 cars and promises to deliver exciting racing in all classes. “The 2018/19 Asian Le Mans Series is shaping up to be the best yet. The field has grown both in terms of quality and quantity this season, and importantly we have seen growth in both Le Mans Prototype and GT entries; something that is integral to the philosophy of ACO racing. The first new entry to be announced this season was a four-car entry from United Autosports. They will race two LMP2 cars and two LMP3. The 2018/19 Asian Le Mans Series will also see the Series debut for European teams Panis Barthez Competition, racing in LMP2, Ecurie Ecosse/ Nielsen Racing with two LMP3s, Inter Europol Competition in LMP3, and Red River Sport by TF Sport with an Aston Martin Vantage GT3. Japanese team Car Guy will also enter the season for the first time with a Ferrari 488 GT3. After an outstanding debut season in prototype racing, 2017/18 Champion Harrison Newey returns to defend his title. This season he will race with Algarve Pro Racing who won the series in 2016/17. 2017/18 LMP3 Champions Guy Cosmo and Patrick Byrne will this season make the step up to LMP2 with United Autosports. 2016/17 LMP3 champions Phil Hanson and Nigel Moore will also return. Phil will be joined by former F1 racer Paul Di Resta in a United Autosport LMP2. Nigel will join Douglas Khoo in the Viper Niza LMP3. 2016/17 Champions Algarve Pro Racing have returned this season with two LMP2 entries, one of which will be fighting for the LMP2 AM Trophy. Chinese based 2017/18 GT class race winner TianShi Racing Team (Audi Sport Customer Racing Asia by TSRT) have returned this season with two Audi R8 LMS. ARC Bratislava and Viper Niza have both also confirmed they will be returning in the same categories they raced in during the 2017/18 season. ARC Bratislava, who finished runner up in the LMP3 class in 2016/17 before finishing 3rdoutright in LMP2 last season have entered their Ligier JS P2 in the LMP2 AM Trophy. Viper Niza have entered a Ligier JS P3. Eurasia Motorsport have also confirmed they are back with an LMP3 entry. Spirit of Race will return with a Ferrari 488 GT3 and a Ligier JS P2 this season after providing support to the highly competitive BBT entry that narrowly missed the outright championship last season. Returning to the LMP2 entry will be the very quick Pipo Derani. Jackie Chan DC Racing x JOTA Sport return with a three-car entry this year, one LMP2 ORECA 05 Nissan and two LMP3s. Racing the LMP2 entry will be the Malaysia trio of drivers that are currently fighting for the FIA World Endurance Championship with the team. Jazeman Jaafar, Nabil Jeffri and Weiron Tan also raced with the Asian Le Mans Series last season. After an outstanding season last year that saw them narrowly miss out on claiming the LMP3 `championship, Neric Wei and Josh Burdon will make the switch to the number 38 Jackie Chan DC Racing LMP3. They will be joined by Hugo de Sadeleer. This year the GT category is set for some exciting racing with some highly talented drivers including three World Championship-winning drivers including the reigning 2017 GT FIA World Endurance Drivers’ Champions James Calado and Alessandro Pier Guidi. Calado races in the Car Guy Ferrari, Pier Guidi in the Spirit of Race 488 GT3. 2012 WTCC Drivers’ Champion Rob Huff will race with Chinese team, TianShi Racing Team Audi. 2017 Le Mans 24 Hours LMGTE Am class winner Dries Vanthoor will also be racing with TianShi Racing in the sister Audi. Johnny Mowlem, 2013 European Le Mans Series GTE Drivers Champion, races in the Red River Sport by TF Sport Aston Martin. Please find the full entry list for the Agile 4 Hours of Shanghai here. Series host Nadia Nash lets you know how you can catch all of the action from the 2018/19 Asian Le Mans Series! The Asian Le Mans Series will again be broadcasting all qualifying sessions and races in full, on the Asian Le Mans Series Facebook and You Tube pages, ensuring as many people as possible can watch the races. In China, the race will be broadcast with dedicated Chinese commentary and will be streamed on over 25 channels in addition to Tencent Sport. As a part of a bolstered broadcast programme for the coming season, there will also be more social media clips, getting fans even closer to the action. Fronting the broadcast will again be the highly experienced Graham Goodwin, Editor of Dailysportscar.com and one of the FIA World Endurance Championship TV commentators. He will again be joined in the commentary box by Jeevan Selvanathan, and in the pitlane will be Nadia Nash. In addition to the live race coverage, a one-hour highlights programme will be produced after each race, and at the end of the season, a full season high lights package will also be broadcast. In addition to the glory of winning the outright and class championships, the teams will be fighting for an elusive invitation to the 24 Hours of Le Mans. The winners of the LMP2 and LMP3 classes will each receive an invitation to compete in the LMP2 class at the 24 Hours of Le Mans in 2019. New for the 2018/19 Asian Le Mans Series, there will be an added recognition for LMP2 amateur entries – not only will they be fighting for their own Championship honours, they will also be for an invitation. There will also be one invitation to race in the LM GTE Am class for the winner of the GT class. The Le Mans Prototype 2, or LMP2 category is reserved exclusively for privateer teams independent of constructors or engine suppliers. In the Asian Le Mans Series, only the previous generation of cars are eligible making it easier for teams to access the top level of competition. These cars can be identified by their blue number plates. New for the 2018/19 Asian Le Mans Series, the LMP2 AM Trophy is open to all-amateur driver line ups, with the winner also receiving a highly coveted entry to the 24 Hours of Le Mans in 2019. Launched in 2015, LMP3 class is the next step on the ACOs endurance racing ladder. The cars have received much praise from both pro and am drivers. They provide the power and aerodynamic downforce required for a thrilling driving experience – making them the perfect entry point to world standard, top tier sportscar racing. These cars can be identified by their purple number plates. Unlike the prototypes, GT cars look more like cars that can be seen on public roads. They are based on high performance cars from great manufacturers such as Aston Martin, Audi and Ferrari and can race with the Asian Le Mans Series in either the GT3 or GT Cup classes. These cars can be identified by their orange number plates. The Asian Le Mans Series, in partnership with Porsche Carrera Cup Asia have united to create the Asian Le Mans Series Porsche Endurance Trophy. The new Endurance Trophy offers the Asian Carrera Cup teams the opportunity to compete in an ACO endurance race, with the same Porsche that they have campaigned all season. Teams competing include the team run by a two time 24 Hours of Le Mans winner, Earl Bamber. Behind the wheel will be a familiar face, Graeme Dowsett who won the GT Cup class in the Asian Le Mans Sprint Cup in 2017 and raced in the final round of the 2017/18 Asian Le Mans Series. Daniel Lu, the 2018 Porsche China Junior, will also take part, racing for EKS Motorsports. Daniel was just 16 when he was awarded the title of Porsche China Junior after beating over 300 applicants to be awarded the title. These cars can be identified by their black number plates with white numbers. The Asian Le Mans Series is proud to be run in partnership with the following partners. Agile Group Holdings Limitedwill be the presenting partner for the 4 Hours of Shanghai. The Agile Group Holdings limited (AGILE) specialises in property development, with extensive presence in diversified range of businesses. Since its establishment, Agile has been dedicated to the pursuit of a high quality of life and is committed to becoming a provider of quality lifestyle. The brand concept of Agile is “Lifestyle of a Lifetime” – a philosophy that fits well with the positioning of the Asian Le Mans Series as the premier endurance racing series in Asia. The two are united in delivering the best products and experiences, at the highest possible standard. Michelin is the world leader, especially in endurance racing where they have dominated for many years. They have tasted unrivalled success in recent years in the 24 Hours of Le Mans where this year they recorded their 20thconsecutive victory. Total is a highly experience fuel supplier, with leading-edge technology. The French petroleum company will exclusively supply the Asian Le Mans Series teams with 102RON fuel specially developed by Total additives and special fuels.